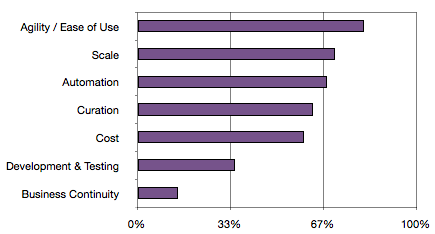 In December we asked our users to take a survey on how they are using Heroku. After collecting the responses, we wanted to share some of the results with the rest of our user community. No surprise, but the majority identify themselves as in the “Software Technology” industry, at 65% of the respondents. The rest of the user base is divided between many groups, from Consultancies with 9%%, to the Arts & Entertainment industry with 6%% and Healthcare at 2.5%%. 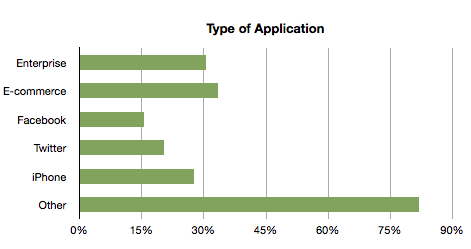 Respondents reported annual web application budgets as high as $10M/year, with over 13% spending >$100K/annually. How are they using Heroku? 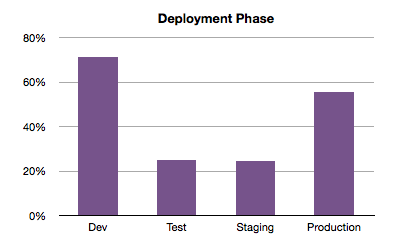 55.6% of respondents are now or shortly deploying production applications onto Heroku. Respondents are at the cutting edge of cloud technology. Characteristics of these applications include thorough caching strategies, asynchronous patterns, and alternatives to traditional relational databases. In a strong shift from previous studies, respondents said loud and clear that agility is the #1 reason to move to the cloud. Cost, previously the #1 response, only just made it into the top 5 in this survey. We thank all the people who took the time to fill out the survey, and hope you find the results as interesting as we do!